I love receiving flowers, I mean who doesn't? Not only do they smell great but they make me feel special and it's not everyday I'm made to feel special. Sometimes it feels as though I'm not appreciated but then I receive some flowers "just because" and it totally makes my day. As a Peanuts Ambassador I was given the opportunity to receive one of the brand new Peanuts Collection floral arrangement from Teleflora. 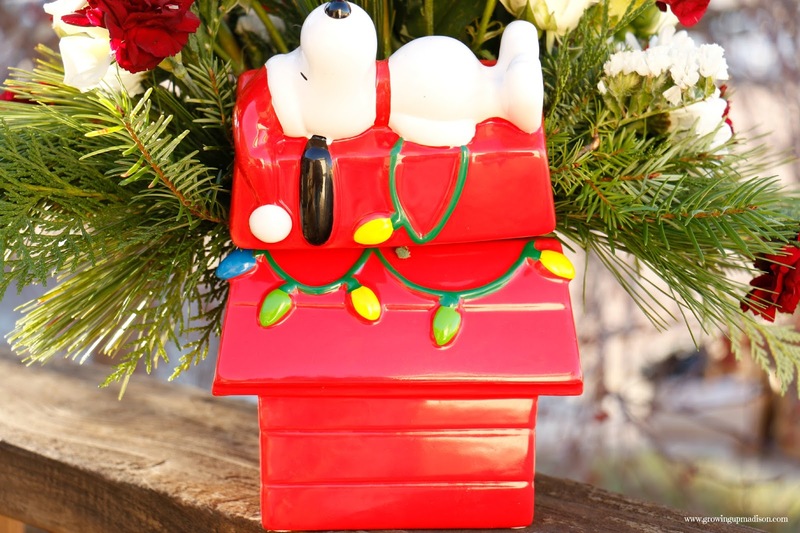 At this time they have the Snoopy's Cookie Jar (shown above) and the Peanuts Christmas Mug. I decided on the Cookie Jar floral arrangement because as a big fan of Snoopy I love the fact that I could use the cookie jar after my flowers were no longer viable. This post was supposed to be totally different, but something happened when I received my flowers that I want to share. Now my daughter is only 3 but she has fallen in love with our next door neighbor. When we first moved into our home we found out that she had just lost her husband. She invited us to visit at anytime because she lived all alone and doesn't get much company. With my anxiety, I'm not comfortable visiting on a daily basis, or at all to be honest. My daughter however has adopted her as her "grandmother". Every morning she would get up and look out the door and say "Joyce is home, I'm going to see her" and I would have to say "it's too early, wait until it's at least 10am". She would run across the street, I live in a cul-de-sac so it's very safe, and ring her doorbell. She has NEVER turned her away and would sit outside with her, or invite her in, for as long as she wants. I've always chalked it up to her being lonely and wanting the company. Well when our flowers arrived I said "these are beautiful and we'll get to put cookies in there" but Madison wasn't thinking about the flowers or the cookie jar. She said "I want to give them to Joyce" without hesitation. It really shocked me to hear a 3 year old wanting to give and not think of herself as most kids her age are prone to do. I told her to get her jacket and we headed across the street. You may have seen the following photo on Instagram, but Joyce was extremely happy to receive them and I couldn't be more proud of Madison. This is what the holidays is all about, spreading and giving cheer to those who need it most. I couldn't be more proud of my little girl! I'm sure one proud mama. Joyce's Snoopy's Cookie Jar Floral Arrangement included red miniature carnations, white button spray chrysanthemums, white cushion spray chrysanthemums, noble fir, white pine, and seasonal decorations. It was also delivered by a local florist and the smell was amazing! 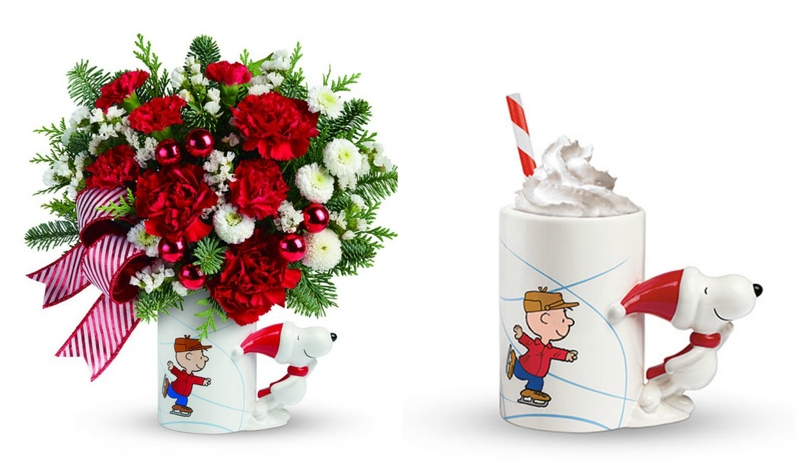 "This season Teleflora joins Charlie Brown, Snoopy, and the rest of the Peanuts gang in celebrating the 50th anniversary of one of the most beloved holiday favorites of all time, “A Charlie Brown Christmas.” Teleflora, the world’s leading flower delivery service, pays tribute to Charles Schultz’s unforgettable TV special with two exclusive floral bouquets and a festive line-up that is sure to delight everyone on your holiday list – from your blanket-toting bestie to your bossy big sister. 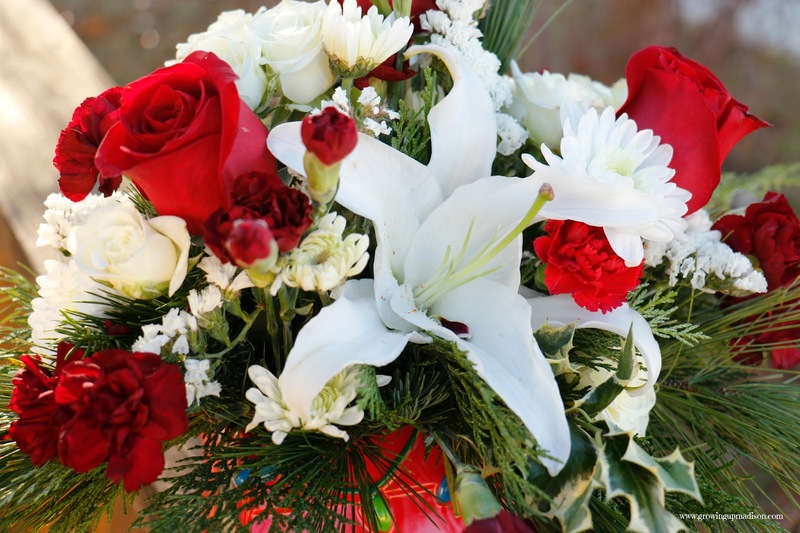 Ideal for gifting, entertaining and decorating, each bouquet arrives professionally-arranged by a local florist and is presented in a keepsake holiday container that is sure to be cherished for many Charlie Brown Christmases to come." Not only are these floral arrangements beautiful but they their keepsakes will make the recipient's day. 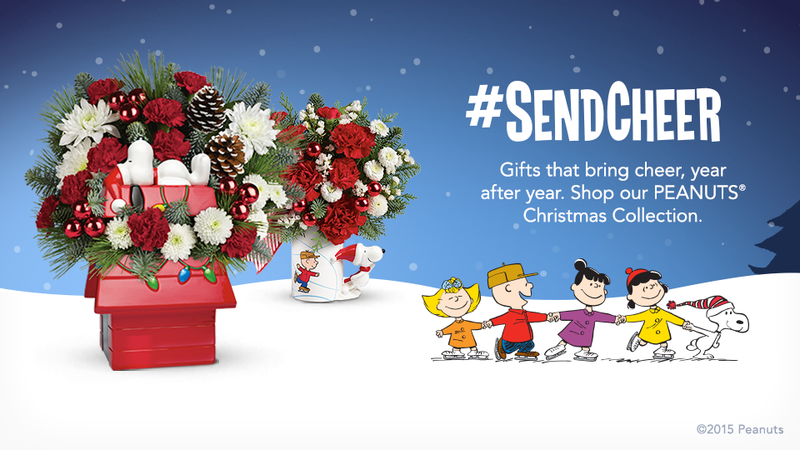 From now until December 24, use code SENDCHEER to save 20% off the Peanuts Collection floral arrangement of your choice. Cheer up someone special today! Let's discuss: How often do you surprise someone with flowers? It's giveaway time! 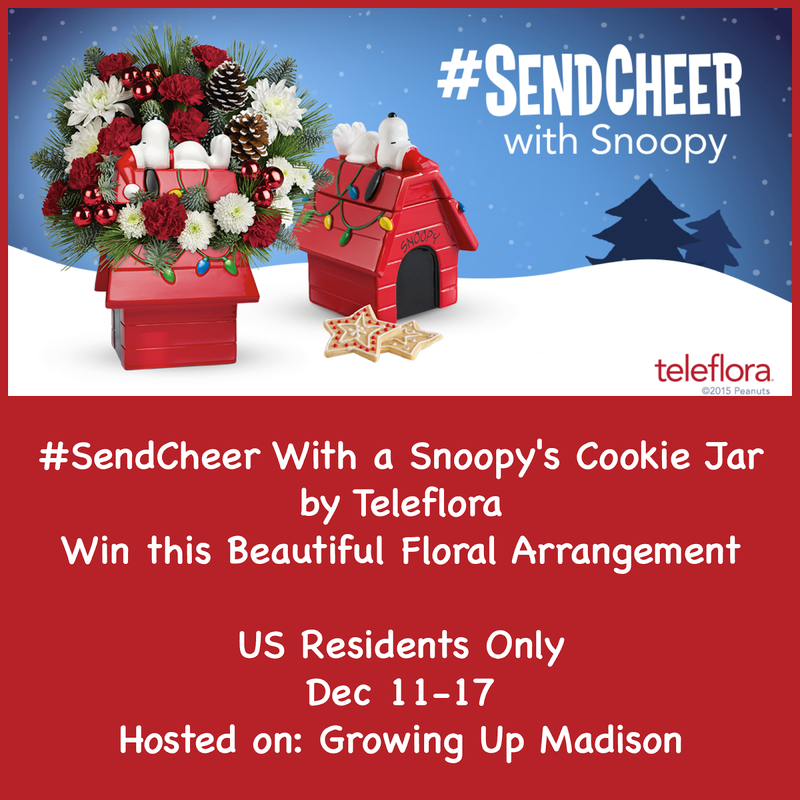 Teleflora wants to give a Growing Up Madison reader the opportunity to win the beautiful arrangement that Joyce received. How awesome is that! 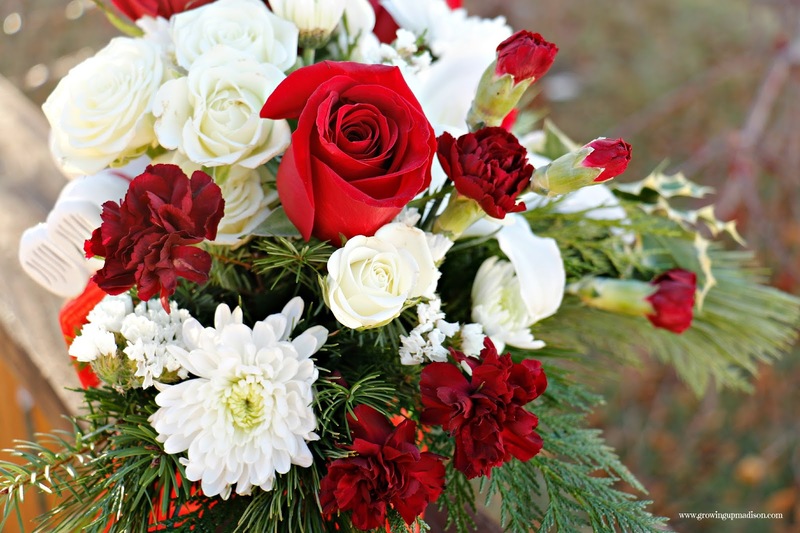 This giveaway is sponsored and will be delivered by Teleflora. Winner will be randomly selected by PromoSimple and will have 48hrs to respond to the email sent. Failure to do so will mean forfeiting your prize and a new winner will be announced. Good luck! Awww you have an amazing little girl. Most 3yr olds would have wanted to keep the cookie jar for themselves. I love how she's adopted Joyce and I'm sure Joyce loves her as much as she loves Joyce. I haven't given flowers to anyone in quite some time but I do know someone who would love to receive this over the holidays. Thanks for the giveaway. What a kind gesture and I can see that Joyce really enjoyed receiving her bouquet. Madison is just too adorable. My mother would truly enjoy receiving the cup. She's a HUGE Peanuts fan. What a beautiful floral arrangement! We are huge peanut fans so this would go over well in our house. What a great giveaway too...good luck everyone!! Aww.. so sweet to give this to Joyce! And it's gorgeous. I love receiving flowers too and I love Peanuts so I suppose I should brighten someone's day with this! That is the sweetest thing! :) Sounds like mamma is doing an excellent job! I should send flowers more often, thanks for the promo code! That makes me tear up! Your daughter is so sweet to think of you neighbor!! I love the look of the Snoopy cookie jar! If I won I'd just have to send this to my sister! She is a huge Peanuts fan too! What a beautiful arrangement! I love the theme. It's so sweet that Madison wanted to give the flowers to her neighbor! Adorable! I would love any of the snoopy items. He makes me smile! I have to keep this because I am a Snoopy addict - this is gorgeous, too. This is such a great gesture and kind thought. What a great little gift to give! Such an adorable little girl too, she seems like she made her day with this kind gesture. So beautiful! 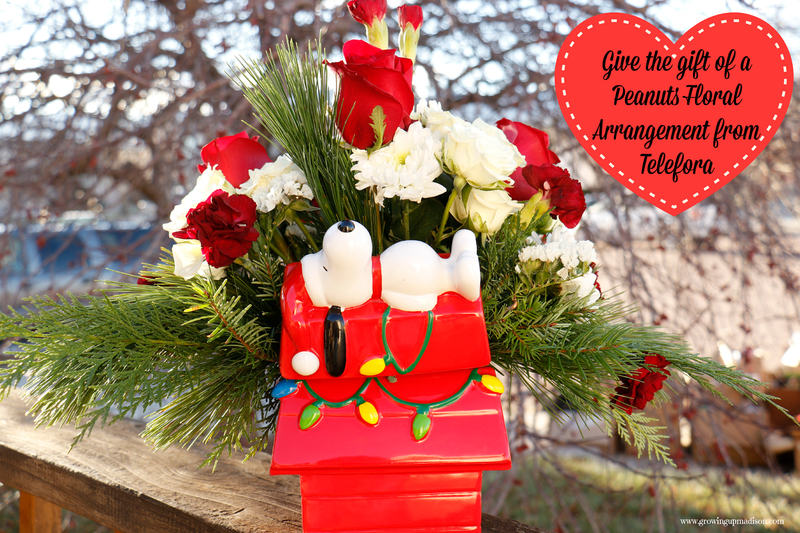 I love that Teleflora has partnered with Snoopy! Such a great way to have flowers and a reusable cookie jar! I think I'd keep for myself! This is such an adorable arrangement. My mother is a huge Peanuts fan and would love this. This arrangement is so adorable. I have liked Peanuts since I was a child and I still find the characters hard to resist. Madison sounds like an amazing young lady!!!! I would give this to my dad if I won it.